A nationwide barbecue chain specializing in St. Louis-style pork ribs. : Nationwide chain Famous Dave's specializes in St. Louis-style pork ribs seasoned with Dave's signature spice rub. Want a meal-in-itself appetizer? Start with the Not'cho Ordinary Nachos, a mound of tortilla chips, topped with the works, including some Texas barbecue. 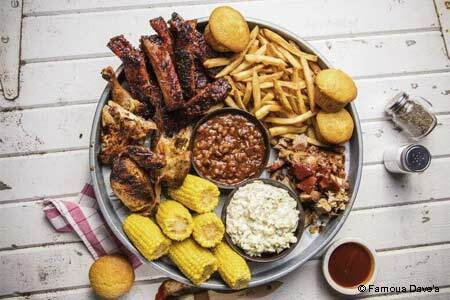 Groups of four or more should order the All-American Feast for a cornucopia of barbecue ribs, barbecue chicken, beef brisket, corn muffins, Wilbur beans and french fries. Other menu items include buffalo wings, double-smoked ham and burgers.